Make a paste with Baking Soda with Water (2 tbs. Baking soda+1tbs. Water). After cleansing your face apply this paste on your face for 4-5 min and rinse your face with ice water and then apply Organic Yogurt for 10-15 min. 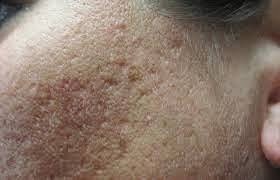 It is a very effective home remedy for acne scars. Baking Soda slough dead skin cells. Daily spray pure Rose Water on your face. It works slowly but more effectively on your scars. You can also add sandalwood with rose water to make a paste. It has cooling and soothing effects to your face. After having your cup of Green Tea you can use the tea bag as a facial toner, it has the most potent healing properties. Ginger Paste for your scar healing is a powerful antibacterial natural remedy. Mash Ginger and dab it with cotton on your scars, leave it for 15-20 min and rub it with your finger tips then rinse it with water. Mixture of honey and lemon juice useful treatment for scars. Lemon Juice is natural bleach that will fade the acne scars and lighten your skin. Vitamin C rebuilds new skin cells. Take 2 tablespoons of Aloe Vera Soothing gel, 1 tablespoon of oatmeal mix it thoroughly and apply it on the affected area and leave it for 15-20 minutes, and rinse it with Luke warm water. It renews skin layer and fill your face scars visibility. Aloe Vera gel is a very effective moisturizer. Daily rub ice cubes in a piece of cotton on affected area 2-3 times for 3 months. Ice cubes shrink the pore size and continues use of it may remove scars. Boil Fenugreek seeds in water and mix 6-8 drops of Lavender Oil in it. When it cools down apply it on scars with cotton and leave it on your face overnight. Egg White to Shrink and Close Acne Scars Take egg white in a bowl and apply it with a cotton ball and leave it on your face to prevent acne and acne scars. It is very effective. Cucumber paste refreshes your skin and heals acne scars. Best natural remedy for sensitive skin. Cucumber and tomato mask is good for the pores. Tomato and cucumber slices are one of inexpensive home remedy for acne and acne scars. Cucumber Juice helps to create a healthy and glowing skin.